The oracle project suite is a complete enterprise level project management solution. They provide a robust flexible approach to define and manage enterprise level projects and the people, schedules, deliverables, and finances associated with them. Generally, enterprise project management involves the collection and coordination of corporate resources (such as people, money, and hard assets) to accomplish a predefined scope of work in a scheduled time frame and budget. Here the Oracle Projects application suite comes with a variety of features to accomplish such work. It enables project managers to effectively oversee their projects, assess progress against predetermined milestones and budgets, staff their projects with appropriate talent, and quickly generate a wide variety of reports. It also helps virtual and globally distributed project teams to efficiently communicate, collaborate, and complete tasks in time. Oracle Projects also gives corporate executives the ability to quickly see how projects are performing across the enterprise. Oracle Projects suite is designed to integrate with many other Oracle application suites (including Oracle HRMS, Oracle Financials, and Oracle SCM) to provide an efficient information flow between modules, facilitate a global sharing of enterprise resources, and provide robust intercompany accounting. It is an integrated cost management solution for all projects and activities within an enterprise. Run across multiple currencies and organizations. It acts as a central repository of project plans and transactions, processes project costs, and creates corresponding accounting entries to satisfy corporate finance requirements. It enables enterprises to simplify customer invoicing, streamline corporate cash flow, and measure the profitability of contract projects. It provides features to review project invoices online, analyze project profitability and corporate impact of project work. It empowers an enterprise to make better use of their single most critical asset: their people. It enables efficient coordination of project resource needs, profitabilty, and organization utilization through the location and deployment of qualified resources to projects across the enterprise. It is integrated with Oracle HRMS to efficiently deploy human resources in various projects across enterprise. It is used for integrated project planning, tracking &real-time project performance management. With Oracle Project Management, project managers can proactively plan and forecast their projects, manage change and performance in real-time, focus on desired project outcomes rather than data management, and make better decisions with less effort. It provides a secure and intuitive user interface through which a team member of a project can see his assigned tasks, issues, deliverables and other project related information. It has structured workspaces such as the Team Member Home page with the help of which, team members can work together more efficiently, make more effective decisions, and deliver superior results faster. It is a comprehensive out-of-the-box reporting solution that delivers aggregate and detail information about the projects in an enterprise directly to the people who need it. Utilizing secure, role-based portals, it provides daily summaries of key metrics including revenue, cost, margin, bookings, backlog, and utilization. It also provides features like drill-down to detail information, cross-project reporting, reporting for multiple calendar types, displaying of information by different periods , comparison of current actual amounts to prior periods and reporting by enterprise and functional currency etc. 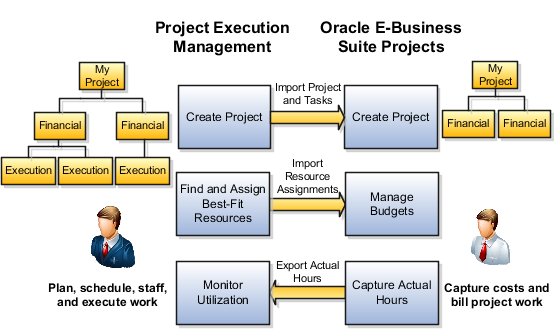 It leverages the rich project management functionality of Oracle Projects to facilitate evaluation and collection of projects in a portfolio. It uses financial criteria, strategic goals, and information on available funds to help you evaluate, prioritize, and select the right projects to match your business objectives. It provides a full range of portfolio analysis reports, charts, and graphs.